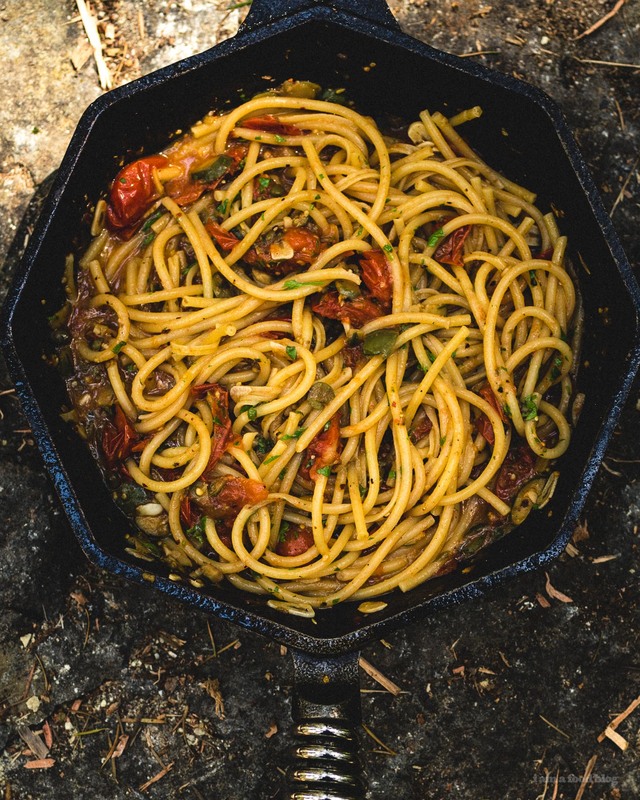 Super flavorful and easy, one pot pasta puttanesca is one of the best camp meals I've made! Mike and I spent the summer camping across Canada and America. The greatest thing that I learned is: East Coast mosquitoes are killer. I felt like I was being eaten alive, every single time I was anywhere that wasn’t the tent. 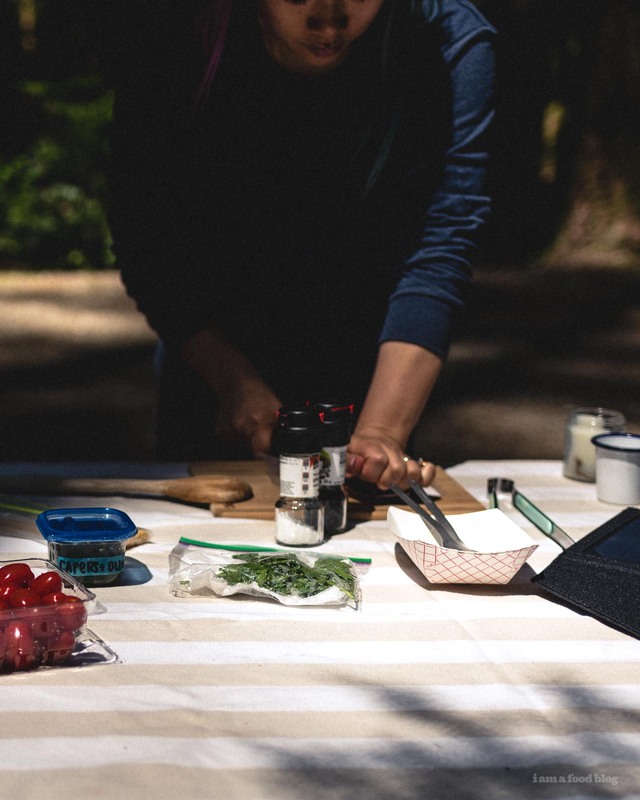 The other thing that I learned was that, even though we had the best intentions, cooking while camping didn’t happen as much as we wanted it to. Most nights we gave in to our deep rooted love for camp-fire roasted hot dogs. Sometimes we had instant noodles. We did manage to cook a couple of times and every time we did we said to each other, let’s do this more often. 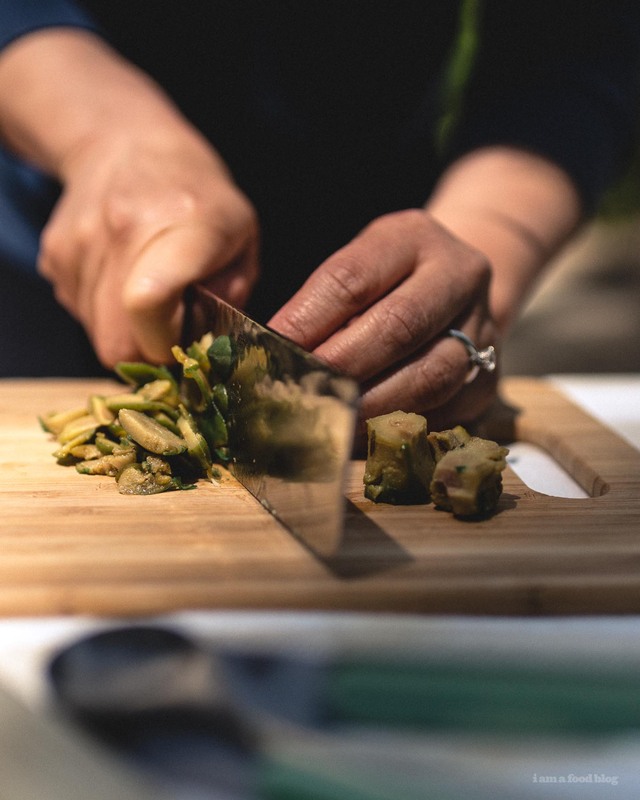 Thing is, when we camp close to home, it’s easy to prepare ingredients and have them ready to go, but while on a massive road trip, with no real access to a well stocked kitchen, not so much. 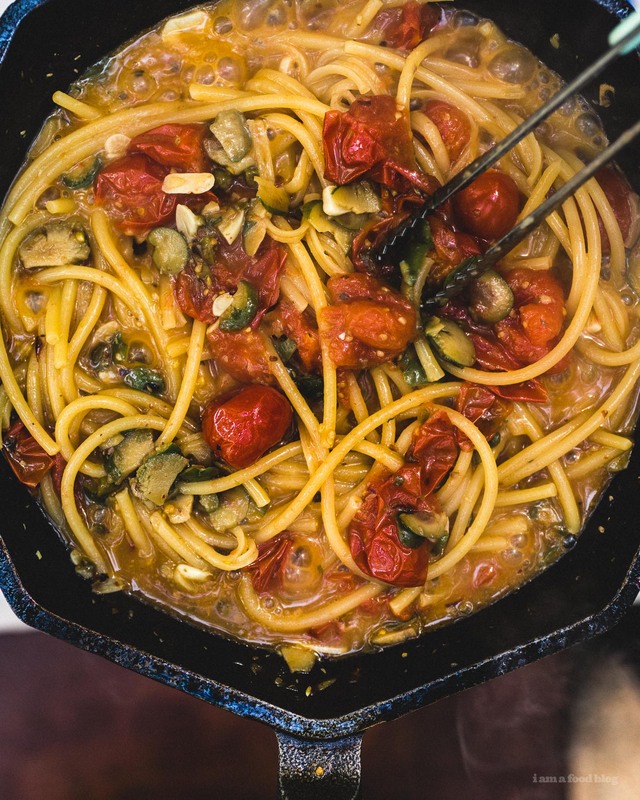 However, one night we managed to cobble together this pasta puttanesca and it was glorious. Puttanesca, to the uninitiated, is literally “in the style of a whore” or, as I like to call it, slutty sauce. The story is: a group of people dropped into a restaurant near closing asking for a meal. The owner didn’t have any of his usual ingredients, but they insisted that he throw something together and puttanesca is what he came up with. 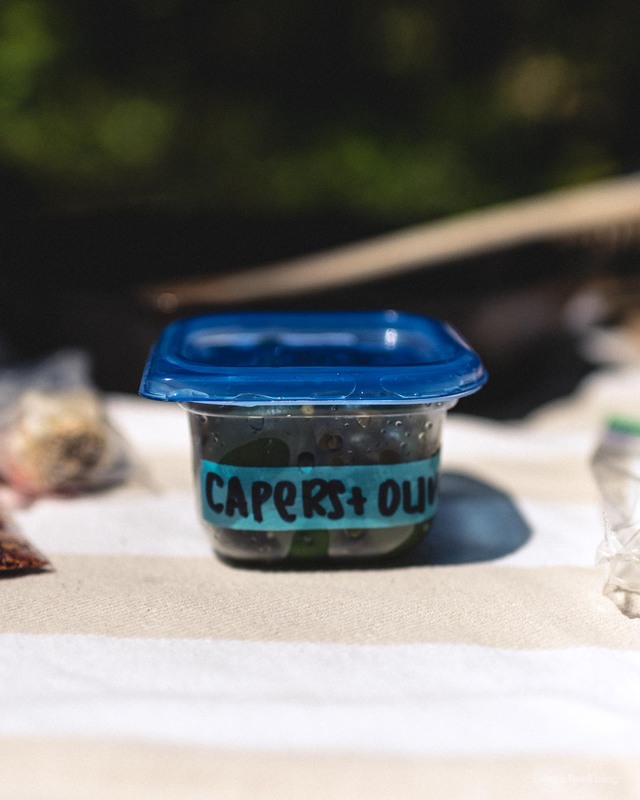 Puttanesca’s usual cast of characters – tomatoes, olive oil, anchovies, olives, capers, and garlic – make it an ideal choice while camping. 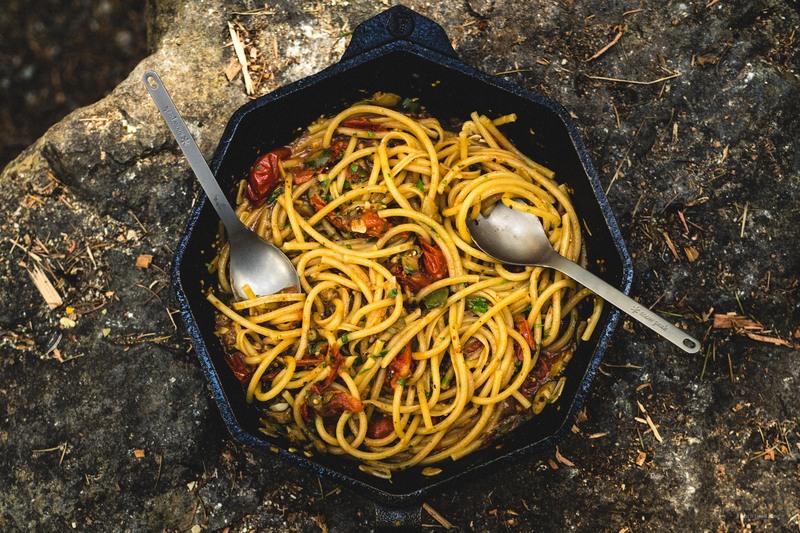 No meat so you don’t have to worry about refrigeration and pasta, because eating pasta by the campfire is downright luxurious. 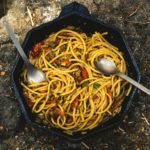 Hearty, spicy, savory, and filling, this is one camp meal I will definitely be making at home! Heat up a touch of oil over medium heat. 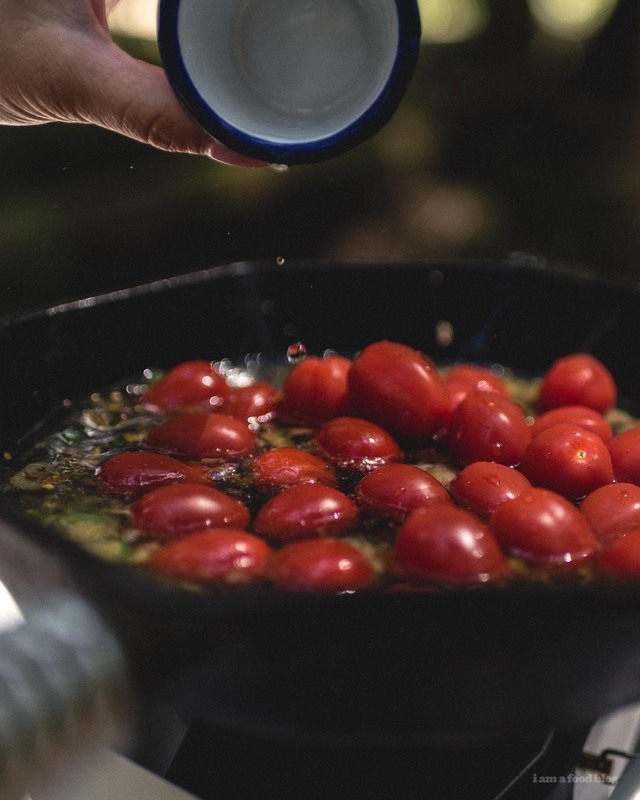 Add garlic, anchovies, pepper flakes, olives, capers, and tomatoes stirring often, until tomatoes start to soften and burst. Add water and pasta to the pan and bring to a boil over high heat. Boil, occasionally stirring and flipping pasta with tongs until pasta is al dente and cooked through and water as nearly evaporated, about 8-9 minutes. Season to taste with freshly ground pepper and top with parsley. Enjoy! Damn, this looks amazing. 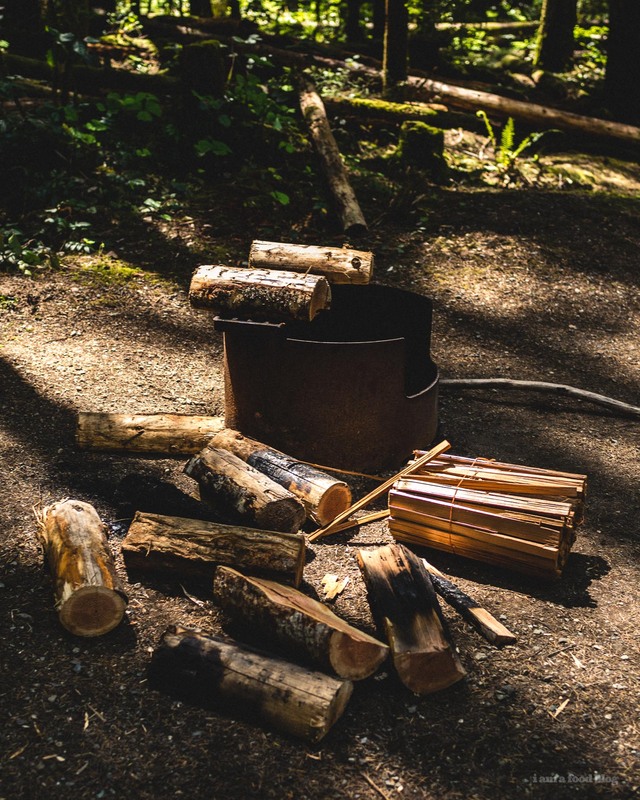 I love camping and nothing beats comfort food around a campfire. 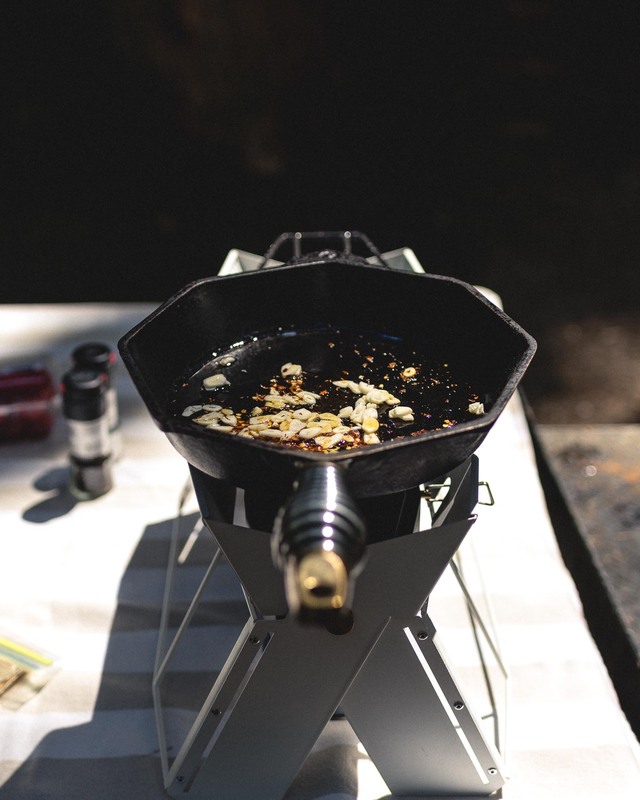 Even though it’s September, there’s plenty of camping left this season. In fact, I can’t wait for cooler weather. Cool weather camping is where it’s at for me. So a hot piping meal like this, coupled with a cool starry night, is right up my alley! And gorgeous pictures by the way! Everything is better out of doors. A bologna sandwich inside can be sad but while camping …! This puttanesca looks amazing and in that setting even better!